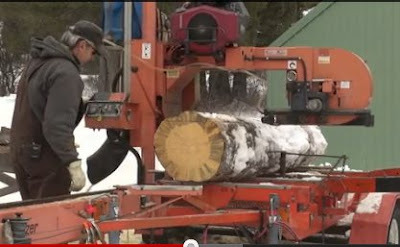 This is a good and interesting video from Peter Brown about a local Bozeman, MT company that is salvaging trees killed by the Mountain Pine Beetle. Distinctive blue coloring of beetle killed pine. It turns out that the fungus that the beetle infects the pines with leaves a blue stain in the wood that makes for very attractive color patterns on the boards when sawed by an experienced sawyer. 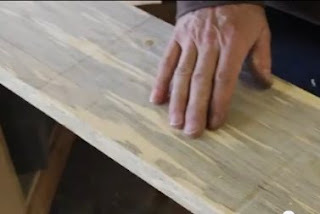 The beetle killed wood's structural properties are unaffected by the beetle infection, and the wood can be used for a wide variety of purposes. The blue staining gives it a distinctive look that has made it popular for furniture and doors. 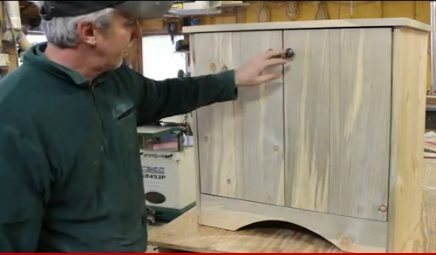 A great example of making good use of local materials that would otherwise go to waste. Neil Wilbert of Beetle Kill Boards with his portable saw mill.